The year 2011 may be seen as one in which regenerative medicine entered its adolescence. Public attention — from investors to desperate patients — finally turned toward this nascent industry with something other than skepticism or unrealistic expectations. The FDA’s approval of Dendreon’s Provenge cellular immunotherapy switched on the spotlight, and cell therapy companies suddenly faced a barrage of questions about cost, manufacturing issues, product development, and patient access. US Policy: In May 2011, US representatives Brian Bilbray (R-CA) and Diana DeGette (D-CO) introduced the bipartisan Regenerative Medicine Act of 2011 (HR 1862) in the US House of Representatives. Major provisions include creation of a multiagency Regenerative Medicine Coordinating Council within the Department of Health & Human Services (HHS); establishment of grant programs to accelerate the availability of life-saving regenerative medicine therapies and research tools; funding of critical regulatory research at the Food & Drug Administration (FDA); and a detailed assessment of federal activities in regenerative medicine as well as progress compared with the national programs of other countries. Unfortunately, in a year when the US Congress could agree on so little, the bill was stalled in the House Committee on Energy and Commerce and has yet to move forward. EU Policy: Meanwhile, in October 2011, the European Court of Justice (ECJ) banned patenting of inventions based on embryonic stem cells. In April 2011, the German Federal Patent Court had referred a Greenpeace case to the ECJ for clarification on how to interpret European biotechnology regulations. (Greenpeace initiated the case against Oliver Bruestle and the Institute for Reconstructive Neurology at the University of Bonn.) As the “Scientists Speak Out” box shows, many experts are concerned that the verdict, which is legally binding for all EU states, will drive development of stem cell therapies outside Europe. No patents can be granted even for inventions that do not involve obtaining new embryonic stem cells and use cell lines established many years ago. In November 2011, an international conference on adult stem cells was held at The Vatican “to foster the highest levels of scientific research on adult stem cells and explore the cultural, ethical, and human implications of these cells.” Of course, the Catholic church is encouraging such work, given its level of discomfort with the embryonic research that preceded it. In October, it had signed a US$1 million deal to help fund NeoStem Inc.’s product development toward becoming a single source for collection, storage, manufacturing, therapeutic development, and transportation of cells for regenerative medicine. The Israeli government is also actively funding cell therapy, giving Pluristem Therapeutics a ∼$2.4 million R&D grant in January 2012. Induced pluripotency and adult stem cells appear to be the answer to cell therapy’s main ethical dilemma. And yet, the most advanced research so far is focused on earlier technology. As one Forbes author put it after the conference: “Embryonic stem cell research needs to be discussed more broadly, even by institutions or groups that have ethical questions about it” (1). Those discussions have only just begun in earnest — but now both sides are willing to talk (an improvement over the recent past). Forging Ahead: A BlissHealth report and discussion event in November listed “gene and cell therapy” as one of three major biopharmaceutical industry topics that have gathered the most momentum lately. In particular, the panel noted a shift in public perceptions surrounding stem cells, citing the Vatican/NeoStem agreement: “Adjustments in the stance surrounding stem cell therapies has seen increasingly widespread support of stem cell research” (2). The other two topics of great interest were arguably related: personalized medicine (a category that many cell therapy concepts fall into) and private stock exchanges. Many young companies (including those involved in regenerative medicine) are turning to private exchanges instead of private investors for necessary funding. According to the report, the industry overall has seen “a marked decrease” in venture capital interest over the past three years, especially in the United States. The report also suggests that private exchanges such as SecondMarket and SharesPost could benefit from that trend. As the 2008 recession slowly thaws, money is beginning to trickle into the industry again. Companies raising money the old-fashioned way include Gamida Cell Ltd. of Israel (US$10 million in May 2012), Promethera Biosciences of Belgium (€23.6 million in March 2012), and ReNeuron of Great Britain (£9 million in April 2012). And this past summer in the United States, NeoStem Inc. of New York won a two-year, $595,000 research grant from the National Institute of Allergy and Infectious Disease (NIAID) to fund evaluation and development of human autologous, pluripotent, very small embryonic-like (VSEL) stem cells as a potential countermeasure against radiation exposure resulting from nuclear accident or terrorism. And in July, the Medical College of Wisconsin received a million-dollar grant from the National Institute of Neurological Disorders and Stroke to study the application of genetically modified stem cells for chronic pain. Governments are still a significant source of funding in regenerative medicine (whether direct or indirect through academic institutions). For example, in April 2012 the Chinese government announced plans to invest 33 billion won (about $5 billion) into stem cell research and regenerative medical treatment for this year — four times as much as it did in 2011. And the US state of Connecticut announced in June that it would divide $9.8 million in grants among 19 local stem cell research projects. New research centers continue to open all over the world. For example, England’s University of Cambridge announced in August 2012 that it will create a new stem-cell center (like those established at the University of Oxford and Harvard University) using £8 million ($12.5 million) from the UK Medical Research Council and the Wellcome Trust. An 8,000-m2 facility will be constructed at the Cambridge Biomedical Research Campus, home to the largest cluster of biotechnology companies in Europe. And Rensselaer Polytechnic Institute of New York opened a new $2.45 million laboratory devoted to stem cell research about the same time with funding from the New York Stem Cell Science Program, known as NYSTEM. It’s part of the new Rensselaer Center for Stem Cell Research created to lower the cost for researchers across the state. Researchers can conduct work there free for the first six months, and their organizations will be charged $2,000/ year for each researcher afterward. According to a 2011 report by the UK patenting authority, growth in regenerative medicine has slowed to a steady level since 2003. Granted patents have declined since then, but it is not clear whether that is due to “fundamental legal issues of patentability . . . patent quality, or patenting strategies within the industry” (3). The United Kingdom’s IP office reports that 47% of inventions in regenerative medicine worldwide belong to small portfolios — indicating a fairly vigorous community of small players with room to grow. This should lead to larger patent portfolios in the future. But clearly, the ECJ ruling will have a devastating effect. The United States leads other countries by a large margin as the source country for nearly half of all inventions reported in the UK study (3). Other leading countries are Japan, Germany, China, Canada, and the United Kingdom. With the data corrected to give less weight to countries that tend to patent more frequently overall, the authority found that Israel, Australia, Canada, and the United States show greater than expected levels of invention. And China, Korea, Germany, France, and Japan showed a lower level than expected (3). The largest patent classifications in regenerative medicine are “materials for grafts/prostheses/coating containing added animal cells,” “cells from the blood or immune system (hematopoietic stem cells, uncommitted or multipotent progenitors),” and “embryonic cells (pluripotent cells e.g. embryonic stem cells)” (3). Leading applicants are the University of California, General Hospital Corporation, and Massachusetts Institute of Technology. Five of the top 10 are universities, all but one of those (Japan Science and Technology Agency) in the United States. Leading inventors David Rueger, Charles Cohen, and Hermann Oppermann all have a high grant rate of ∼70% for their patent applications — and all three work with Creative Biomolecules Inc., Stryker Corporation, and Curis Inc. (3). they are named as coapplicants” (3). The report found that smaller industry regions (such as the United Kingdom) show stronger collaborations among universities and industry, both domestic and overseas. As a sector grows, however, “increased fragmentation may occur as new entrants appear and grow, and competition develops” (3). Mergers, Acquisitions, Collaborations: It’s been a year for making business deals throughout the biopharmaceutical industry, and the field of regenerative medicine is no different. Stock market volatility and squeamish venture capitalists are sending small companies elsewhere in search of funding — and big companies see that as an opportunity to reenergize their development pipelines. Established biotechnology and drug companies are showing interest in regenerative medicine — and putting money on the line. For example, Shire plc took over Advanced BioHealing, Inc. primarily for its proven Dermagraft and TransCyte tissue therapies. Perhaps because of their similarity to well-known transplant medicine, tissue therapies are outpacing cell therapies so far in product approvals. Tigenix and Genzyme both have products on the market too. This year, Aastrom Biosciences moves into phase 3 with a critical limb ischemia treatment. And Mesoblast has partnered with Cephalon to commercialize adult stem cell therapeutics for degenerative conditions of the central nervous and cardiovascular system (2). What companies have advanced the most in the past year? Zami Aberman (CEO of Pluristem Therapeutics, Inc.) told me unequivocally: “Companies that have obtained collaborations with pharmaceutical companies have advanced the most.” As an example, he cited Pluristem’s exclusive out-license agreement with United Therapeutics Corporation for the use of its PLacental eXpanded (PLX) cells to develop and commercialize a cell-based pulmonary hypertension treatment. A few major advances in using zinc-finger nuclease (ZFN) technology — used by SAFC to make proprietary cell lines — were made in 2011. First of all, the usability of this technology in clinic was demonstrated in an HIV cell therapy trial. The first preliminary results of Sangamo‘s HIV clinical trial were reported in September 2011. The company uses ZFN technology (targeting CCR5) to make human T-cells resistant to HIV. John Zaia from the City of Hope Medical Center proposed using the same approach on hematopoietic progenitor/stem cells (HSPC). His team will isolate HSPC from AIDS patients, use CCR5-specific ZFNs, and return “edited” HIV-resistant stem cells to the patients. Nature published a demonstration of in vivo genome editing using ZFN technology in July (1). Researchers were able to restore hemostasis in a mouse model of hemophilia by applying specific ZNFs. Targeted gene correction of laminopathy-associated LMNA mutations (4). ZFN-based genome editing was chosen by Nature Methods as “Method of the Year” for 2011. 1 Li H, et al. In Vivo Genome Editing Restores Haemostasis in a Mouse Model of Haemophilia. Nature 475, 2011: 217–221. 2 Zou J, et al. Oxidase-Deficient Neutrophils from X-Linked Chronic Granulomatous Disease iPS Cells: Functional Correction By Zinc Finger Nuclease–Mediated Safe Harbor Targeting. Blood 117, May 2011: 5561–5572. 3 Soldner F, et al. Generation of Isogenic Pluripotent Stem Cells Differing Exclusively at Two Early Onset Parkinson Point Mutations. Cell 146, July 2011: 318–331. 4 Liu G-H, et al. Targeted Gene Correction of Laminopathy-Associated LMNA Mutations in Patient-Specific iPSCs. Cell Stem Cell 8(6) 2011: 688–694. The biggest story when we were working on our first cell therapy supplement in 2011 was the first US product approval: Dendreon’s Provenge prostate cancer vaccine. By the time our special issue was making its debut, however, questions had arisen over whether Medicare would approve the drug for reimbursement — and soon after, Dendreon was reporting disappointing sales of this fairly expensive product. However, by the end of the year, that story had changed (6). Scrip reported in early January 2012 that Dendreon saw unexpectedly high fourth-quarter sales — and as a result, the company’s stock price grew by nearly 50%. A successful first year of revenue makes the Provenge vaccine “one of the top 10 oncology product launches in history,” touted CEO Mitchell Gold. He told Scrip, “These new products like Provenge are not like other things. It takes time for physicians to learn how to use them, specifically when you have a reimbursement issue like we had last year, and for physicians to get comfortable with it.” He also noted that Dendreon is “not a single-product company,” pointing out that the prostate cancer vaccine is based on an antigen platform technology that uses a patient’s own cells (6). Further indicating the decline — and suggesting the eventual demise — of embryonic stem cell (ESC) technology, Geron terminated its embryonic-cell clinical program in November 2011 (7). However, the two remaining publicly traded companies working in that arena — Advanced Cell Technology and BioTime — posted modest gains in response. Pfizer maintains an ESC collaboration with University College London. They and private companies Cell Cure Neuroscience and ViaCyte all continue to move forward with their ESC programs. Geron may have been the commercial pioneer, but its getting out of the game just might have made more room for others. nly, however, “the more scientifically, clinically and commercially advanced adult cell-based therapies continue to surge forward,” according to a January 2012 Regenerative Medicine article, “through the regulatory process with Athersys, Mesoblast, and Osiris leading the charge, followed by a growing portfolio of smaller cell therapy companies” (7). Advancing another approach, South Korea’s government drug agency cleared the way in January for commercial sales of what it called the world’s first approved medicine based on stem cells collected from other people. Seoul-based Medipost’s Cartistem product will help regenerate knee cartilage using stem cells developed from newborns’ umbilical cord blood. That makes it the world’s first approved allogeneic stem cell drug. Medipost had invested 27 billion won ($23.8 million) from private investors and government funds into its development since 2001. The drug is surgically injected into a patient’s knee(s). Two of the world’s top-10 drug-makers are in talks with Medipost regarding a worldwide license to make the drug. Clinical trials have been under way in the United States since 2011, and final US trials involving a large number of people are planned for 2015. The stem cell sourcing debate is far from over. In June 2012, the University of Michigan had announced that it had added six new embryonic cell lines to the national registry — nearly four years after Michigan voters approved a state constitutional amendment allowing scientists to derive embryonic stem cell lines using surplus and abnormal embryos from fertility clinics. And London researchers published results a month later showing that cells taken from amniotic fluid can be transformed into a more versatile state similar to embryonic stem cells and thus could offer an alternative. Umbilical cord blood and placental stem cells still show promise, as in the case reported in June 2012 of a child who’d lost most of her hearing to a severe ear infection. In January the two-year-old received stem cells from her own banked cord blood through an FDA-approved trial at Memorial Hermann-Texas Medical Center. And six months after those cells were infused into her damaged inner ear, the girl has shown dramatic improvement in her ability to hear. 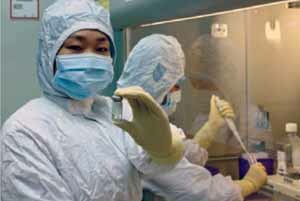 Meanwhile, California-based medical equipment company ThermoGenesis Corp. is expanding its reach into China, where its BioArchive system has been approved for market: The equipment was developed to freeze and store stem cells harvested from umbilical cords and placentas retrieved in delivery rooms after childbirth. The number of potential applications for stem cells of all derivations continues to grow, as evidenced by numerous ongoing animal studies and clinical trials — far too many to list here. They include potential treatments for ischemia, cartilage repair, liver failure, red–blood-cell production, scleroderma, multiple myeloma, sickle-cell anemia, and even HIV/AIDS, just to name a few. A group of Australian researchers is working on cell delivery. In July 2012 Allied Healthcare Group and and the country’s Commonwealth Scientific and Industrial Research Organisation (CSIRO) joined forces to develop a new platform for deliverying stem cells to the heart. Tissue matrices treated with Allied Healthcare unit Celxel’s ADAPT tissue engineering technology will be used as scaffolds for delivery of adult mesenchymal stem cells in heart failure models. Celxel has already developed its CardioCel cardiovascular patch to repair pediatric heart deformities, with successful animal trials and a phase 2 clinical study. ADAPT tissue matrices have also been used in hernia and pelvic floor repair procedures. A Georgia company — this one a spin-off from the Georgia Institute of Technology — is also working on cell delivery. In June 2012, SpherIngenics secured US Department of Defense funding for protecting cells from death and migration away from their treatment site. Using microbead technology developed in the Wallace H. Coulter Department of Biomedical Engineering at Georgia Tech and Emory University, the company is producing protective capsules for delivery of cell therapies. And researchers at the University of Liverpool are tracking stem cells in vivo using superparamagnetic iron-oxide nanoparticles (SPIONs) to label them before they are administered to a patient. The particles are detected using magnetic resonance imaging (MRI) to help clinicians determine whether the cells reach their intended target. SPIONs degradation reduces the effectiveness of those scans over time. These UK scientists reported (also in June 2012) on photothermal imaging methods to show SPIONs in cells before adminstration — to learn where and how they are taken up and help predict how they will perform inside a patient’s body over a long period. They hope to improve SPION labeling so the particles can survive longer without affecting the function of transplanted cells. Zinc-finger nucleases (ZFNs) are the subject of great interest in genetic engineering — identified by some experts as 2011’s technology of the year (as in the box on the previous page). These engineered DNA-binding proteins facilitate targeted editing of a genome by creating double-strand breaks in DNA at user-specified locations. Those breaks are important for site-specific mutagenesis in that they stimulate a cell’s natural DNA-repair processes: homologous recombination and nonhomologous end joining (NHEJ). Those cellular mechanisms can be harnessed to generate precisely targeted genomic edits to create cell lines and populations with targeted gene deletions (knock-outs), integrations (knock-ins), or modifications. SAFC offers a catalog of animal-component–free, validated, and quality tested ZFNs for use in the biopharmaceutical industry. Cell Culture: In March 2012, EMD Millipore began a collaboration with the Centre for Commercialization of Regenerative Medicine in Toronto, Canada, to optimize conditions for cultivate stem cells in Mobius CellReady stirred-tank bioreactors. They will develop a proprietary commercial kit with reagents and associated methodologies for bioreactor culture of stem cells on microcarriers. “As the demand for stem cells used in drug discovery and clinical applications grows, effectively translating the promise of stem cells into therapeutic reality will require large-scale, industrialized production under tightly controlled conditions,” said Robert Shaw, commercial director of EMD Millipore’s Stem Cell Initiative. Most current production uses stacks of two-dimensional tissue-culture vessels, which is an expensive and labor-intensive process. The goal of the joint project is to enable large-scale cultivation, and Shaw said that could accelerate the progress of cell therapies into the clinic. roducts. The center launched in Toronto’s Discovery District in June 2011. Taking another approach, Pluristem Therapeutics is scaling up its own bioreactors from 5-L to 15-L size as part of a plant expansion. The company is planning for commercial production of PLXcells scheduled for upcoming clinical trials. Using proprietary 3D manufacturing technology, a 15-L bioreactor will yield ∼30 billion cells per reactor run, enough cells for 100 doses (300 million cells each). Furcht L, Hoffman W. The Stem Cell Dilemma, Second Edition. Arcade Publishing: Minneapolis, MN, October 2011. The new edition of this 2008 book — originally subtitled “Beacons of Hope or Harbingers of Doom?” — offers a less provocative subtitle of “The Scientific Breakthroughs, Ethical Concerns, Political Tensions, and Hope Surrounding Stem Cell Research.” That better reflects the tone with which scientist and physician Leo Furcht and medical editor William Hoffman explore their subject. After explaining for lay readers what stem cells are, how they work, and why they’re controversial, the authors analyze the latest scientific, clinical, legislative, and legal developments in the field. Stem cell–based medicine debuted >40 years ago in the form of life-saving bone marrow transplants. Modern research has enabled blind mice to see, paralyzed rats to walk, and people to have tissues and organs rebuilt using their own cells. The field of regenerative medicine is poised to provide effective treatment for many genetic and chronic conditions. But all the hope and promise is tempered by a deep fear some people have that, instead of helping humanity, stem cells derived from early stage human embryos will contribute to a moral collapse. A new foreword was written by Brock Reeve, brother of the late Christopher Reeve and executive director of the Harvard Stem Cell Institute. “No area of biological research in the past decade has so captured our imagination as stem cell science, which the general public and the scientific community alike believe holds great promise for future therapies for disease and traumatic injury,” he says. The stem cell race is global. From advancing research in Asia to US Department of Defense efforts toward countering the threat of potential bioweapons, The Stem Cell Dilemma describes how we are just beginning to grapple with the promise of revolutionary stem-cell treatments and the dangers posed by emerging biological technologies when they get into the wrong hands. Author Leo T. Furcht is Allen-Pardee professor and chairman of the department of laboratory medicine and pathology at the University of Minnesota Medical School and chairman of the University of Minnesota Physicians board of directors. He’s also past president of the Federation of American Societies for Experimental Biology (FASEB) and holds several key patents in the stem cell field. “Large-scale manufacturing of our PLX cells is vital to the success of our clinical trials and subsequently important for the potential commercialization of our PLX products,” said Aberman. Perhaps the most talked-about topic on the practical side of regenerative medicine as 2011 became 2012 was the concept of “peak serum” (7). Whereas the biopharmaceutical industry as a whole has embraced serum-free, animal-free, protein-free, and chemically defined media for manufacturing purposes, bovine serum is still used in most cell therapy processes. One article warns that “Current stocks and production rates of serum suitable for GMP manufacture may only be sufficient to support the production of one blockbuster cell therapy” (8). And protein manufacturers know that’s not the only reason cell therapy companies should be thinking about alternatives. Vaccine companies and makers of recombinant therapies have been moving away from serum for over a decade now, primarily because of contamination concerns. Risk assessments show that the danger of infecting patients with adventitious agents from serum is just too high — no matter the source country or manufacturing controls upstream. As demand has decreased, the availability of GMP-grade serum is declining. “Given the decline in both serum processing and its underpinning infrastructure, its role as a key manufacturing component for the future . . . is not tenable” (8). So what are the alternatives? Cell therapy manufacturers face similar questions that bioprocessors faced around the turn of the century. Luckily for them, however, companies involved in GMP animal cell culture have cleared a path. “Changes in the type of serum can alter fundamental properties of a cell type, including proliferation kinetics and specific phenotypical characteristics such as cell potency and identity” (7). Those worries will be familiar to anyone working in antibody production. And this is one area where communications between cell therapy interests and the larger biopharmaceutical community will be particularly useful. “The serum availability bottleneck is not theoretical but already starting to impact the sector, as can be witnessed by the significant rises in the price of GMP-grade serum in recent years” (8). Contract Manufacturing: “Contract R&D” was another important driver cited in BlissHealth’s November report and panel discussion. And it may be the best way for cell therapies to move forward. For example, Florida Biologix is known to the biopharmaceutical world as a contract manufacturer that makes, tests, and fills biologics and vaccines. Recently, however, the company converted a classic protein manufacturing suite in its facility in Alacua, FL, to handle the demands of a new cell therapy customer in just six months (Figure 1). In November 2011, new CMO MaSTherCell began operations in Gosselies, Belgium. Designed for clinical and commercial production of cell therapy products, the company’s new GMP facility at the Charleroi Brussels South Biopark includes ∼2,000 ft2 of offices and cleanrooms. “The cell therapy sector is growing fast and continuously,” added chief business officer Didier Argentin, “and we intend to be among the major players of the sector.” Chief financial officer François Lesage, said that MaSTherCell has secured >5 million euros in funding, some from the management team and the rest from Brussels University through Theodorus Investment Funds, from regional investors, and from cofounders of Artelis, a company focused on disposable bioprocess solutions, from optimization to intensification. Chief operations officer Patrick Stragier said the company expects to employ 15 people by the end of 2012 and 50 by 2019. A leader in development, manufacturing, and testing services for cell-based therapeutics, Lonza Walkersville is part of a giant in contract manufacturing and research, and its parent Lonza works in many aspects of biopharmaceutical development. In 2011, Lonza expanded cell therapy manufacturing into Asia with a new facility at its Tuas Biomedical Park site in Singapore. The most familiar contract manufacturer that specializes in regenerative medicine is Progenitor Cell Therapy (PCT), which is now a wholly owned subsidiary of NeoStem. Headquartered in Allendale, NJ, the company provides GMP cell manufacturing and consulting services to address regulatory, financial, technical, process, and quality system strategies. Services at its facility in Mountain View, CA, include support and consulting related to process and product development, validation, due diligence evaluations, tissue collection, processing, and storage, product manufacturing, distribution, and transportation. Since its founding around the turn of the century, PCT has worked on projects for Dendreon, Proneuron, and Cellerant Therapeutics. It has worked with BD Biosciences and Invitrogen on comarketing/codevelopment projects for cell therapy manufacturing and testing. And in January 2012, the company signed a contract to provide Islet Sciences, Inc. with protocols, procedures, systems, equipment, testing, quality controls, manufacturing, and distribution services to support the development and commercialization of encapsulated porcine islet cells for diabetes treatment. Islet’s CEO, John Steel, explained his company’s decision to outsource in terms of its own core competencies in research. “Progenitor’s expertise and well-earned reputation for quality in supporting cell therapy services will be critical to our success.” As many an emerging biopharmaceutical company has discovered, sometimes it’s best to leave the GMP work up to those who know their way around the regulatory landscape. Already we’re seeing stories about autologous and allogeneic stem cells used to treat dogs and horses. The testing and approval process for veterinary products is more expedient than for human medicines. Autologous stem cell–based treatments have been commercially available to practicing veterinarians for treating horses with ligament injury, tendon injury, osteoarthritis, osteochondrosis, and subchondral bone cysts since 2003 in the United States and 2006 in the United Kingdom. Similar treatments have been available to veterinarians for treating dogs with tendon injury, ligament injury, and osteoarthritis in the United States since 2005. Look up the “comments” section of any related news story online, and the preponderance of discussion will be revolve around whether/why/when this will or will not be available for humans. As CBS News’ 60 Minutes reported early in January 2012, the concept of “stem cell tourism” is on the rise (9). The public is hungry for these treatments, and some of the desperate who can afford it are falling for the so-called “miracle cures” of flim-flam artists like medicine-show customers did a hundred years ago. The US FDA and Europe’s EMA are aggressively pursuing the perpetrators. And in January 2012, China ordered a halt to unapproved stem cell treatments and clinical trials, seeking to rein in largely untested stem cell therapies being offered across the country. Hospitals and clinics in large Chinese cities have used stem cell therapies for treating a range of diseases — treatments backed by little or no scientific evidence and considered experimental at best. At some large general hospitals, patients from all over the world pay thousands of dollars for treatments advertised online. Many come away with little or no improvement, and a number have died. The Chinese Ministry of Health began a one-year program in 2012 to better regulate this sector. I asked Zami Aberman (CEO of Israel’s Pluristem Therapeutics, Inc.) how potential patients themselves can steer clear of the scammers. Many regenerative medicine trials are conducted by physicians and clinics rather than companies, as we’re used to in the pages of BPI. “As a rule of thumb,” he said, people should “be suspect of any stem cell treatments that are not offered under approved studies authorized by regulatory bodies, such as the FDA and the EMA. When the trials are legitimate, the stem cells are administered for free.” Cell therapies are subject to the same IND/BLA approval process as any other biologics. Cheryl Scott is senior technical editor of BioProcess International, 1574 Coburg Road, #242, Eugene, OR 97401; 1-646-957-8879; cscott@bioprocessintl.com. Unattributed quotes and information herein come from company and organization press releases. 1.) Farrell, J. 2011.. Vatican Stem Cell Conference Gets Thin Coverage. 2.) Miller, MW, and M. Wildrick. 2011.Biopharma: The New DNA, BlissHealth, New York. 3.) Patent Informatics Team 2011.Regenerative Medicine: The Patent Landscape in 2011, Intellectual Property Office, Newport. 4.) Culme-Seymour, E. 2011. Interview: Commercial Translation of Cell-Based Therapies and Regenerative Medicine — Learning By Experience. Regen. Med 6:431-435. 5.) Culme-Seymour, E. 2011. Interview: The Story of Advanced BioHealing — Commercializing Bioengineered Tissue Products. Regen. Med 6:157-161. 6.) Young, D. 2012.Dendreon Rockets on Unexpected High-Growth 4Q Provenge SalesScrip Daily Alert. c Stem Cell Therapy in the Post-Geron Era. Regen. Med 7:17-18. 8.) Brindley, D. 2012. Peak Serum: Implications of Serum Supply for Cell Therapy Manufacturing. Regen. Med 7:7-13. 9.) Stem Cell Fraud: A 60 Minutes Investigation 2012..